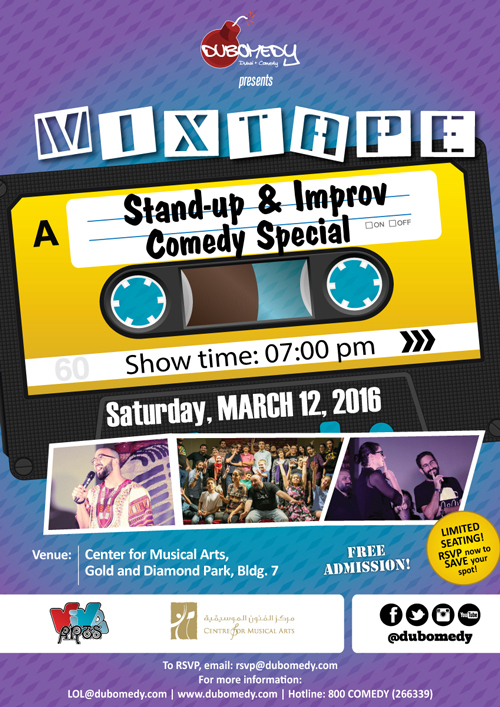 Join us for an evening of laughter as the students of Dubomedy Arts School present COMEDY MIX-TAPE. 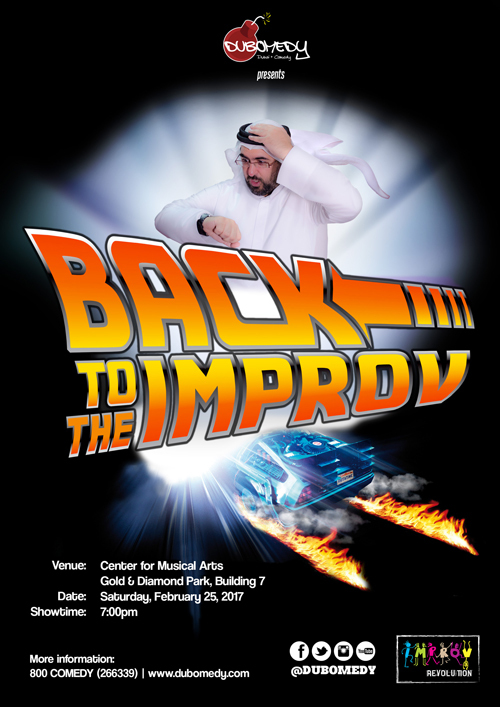 The show is a blend of stand-up comedy sets, improv’ comedy games and special musical guest appearances. 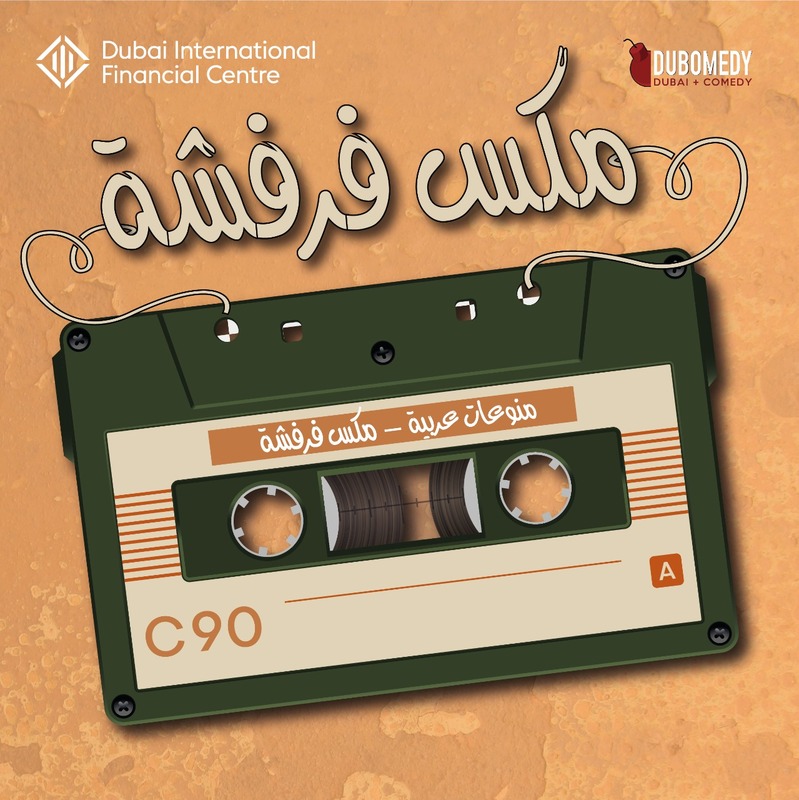 Join us for an evening of laughter as the students of Dubomedy Arts School present ARABIC COMEDY MIX-TAPE. 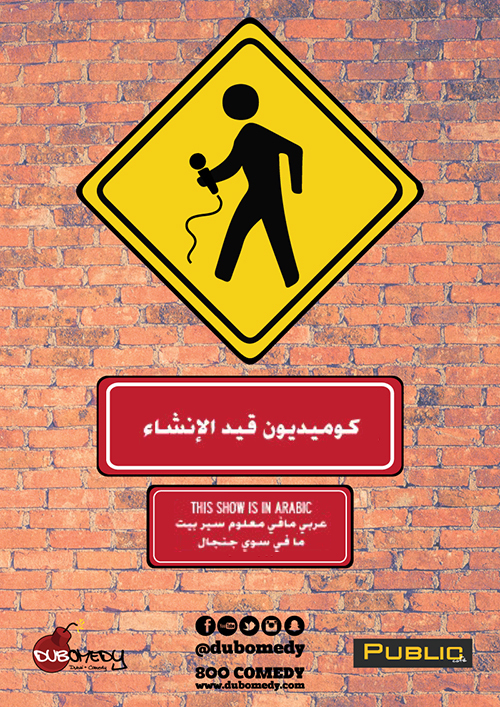 The show is a blend of Arabic stand-up comedy sets, improv’ comedy games and special musical guest appearances. 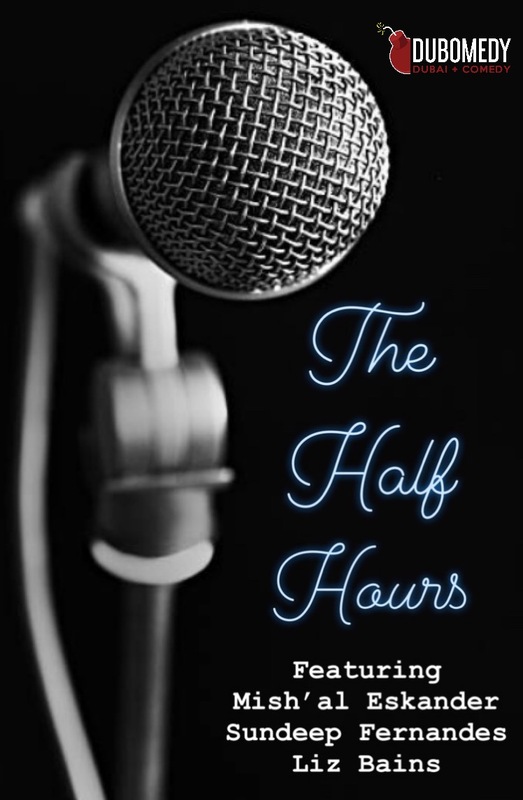 To mark Dubomedy's 11th birthday, we are celebrating three alumni comedians as they debut their 30 minute Stand-up Comedy Specials! The performance will be filmed LIVE featuring brand-new specials by Mish’al Eskander, Sundeep Fernandes and Liz Bains. 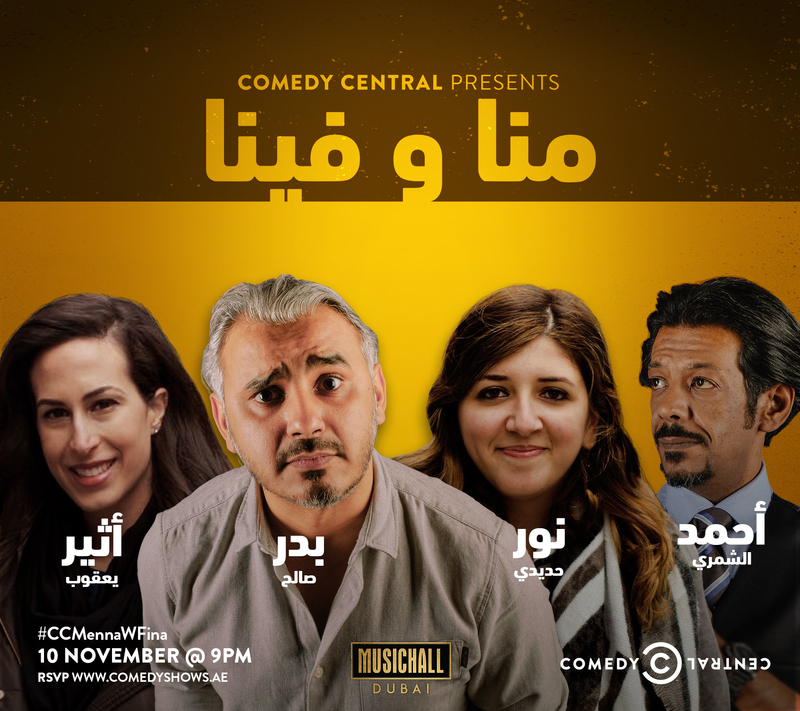 The show will be co-hosted by Ali Al Sayed and Mina Liccione. TIME: 7:30 PM but arrive early for coffee, food or dessert, and to get a good seat! 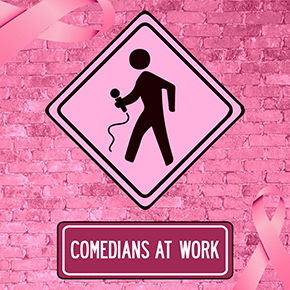 Comedians at Work go Pink! 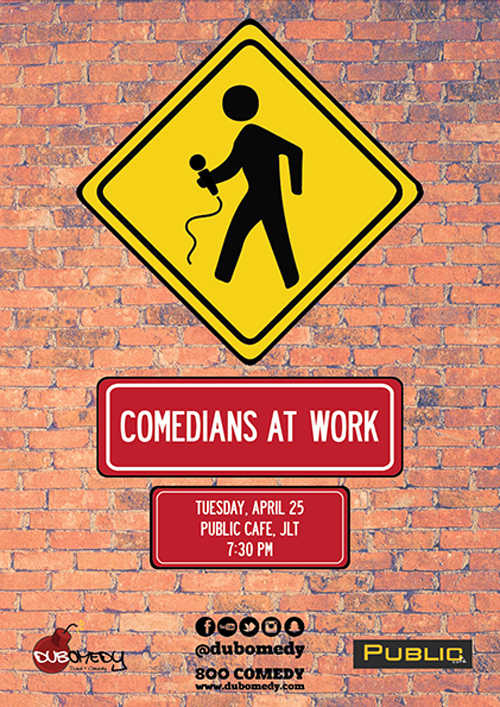 Join us for a special Comedians at Work at Public Cafe in JLT on Tuesday, Oct. 30th! 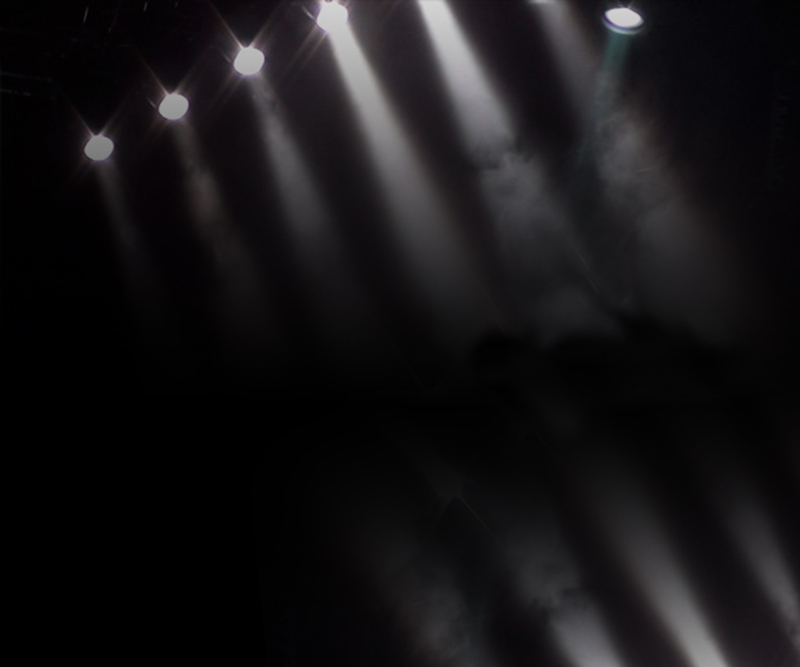 It's a fresh (and free) stand-up night where new and seasoned comedians take the mic. Seating starts at 7:00 PM, show at 7:30 PM. In honor of BCA month we will have some special guests & festivities. Stay tuned! To get on the guest list please shoot us an email to RSVP@Dubomedy.com with your details. Please note, the show is for ages 13 y.o.+ only. How Much: FREE! Email RSVP@dubomedy.com to get on the list! 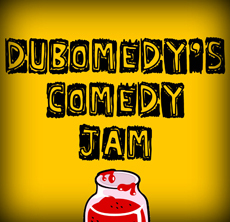 On Saturday, September 29th comes Laban Up presents.... Dubomedy's Comedy Jam! We are bringing together a gang of our alumni for a FREE reunion show at Warehouse Four! 10 years, 10+ comedians and live music! To get on the wasta list send your full name and number of guests to RSVP@Dubomedy.com. SURPRISE! We're kicking off our 11th season with a BIG bang! Join us this Wed, August 29th for a special impromptu stand-up show featuring some of our favorite comics! 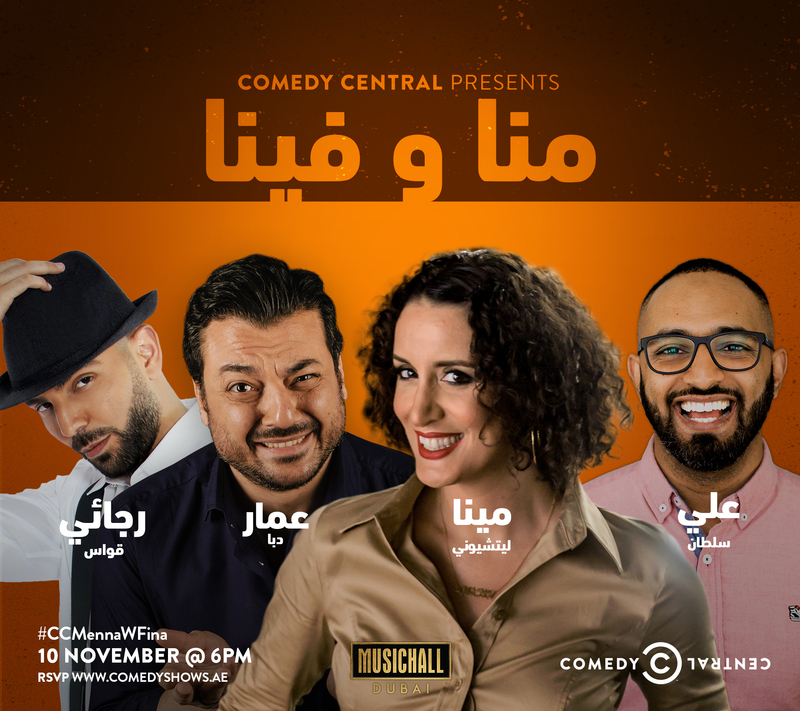 Nemr Abou Nassar (Showtime), Khalid Mansour (SNL Arabia) and Ahmad Alshammari (Kuwait Comedy) with host Ali Al Sayed (Comedy Central Arabia.) 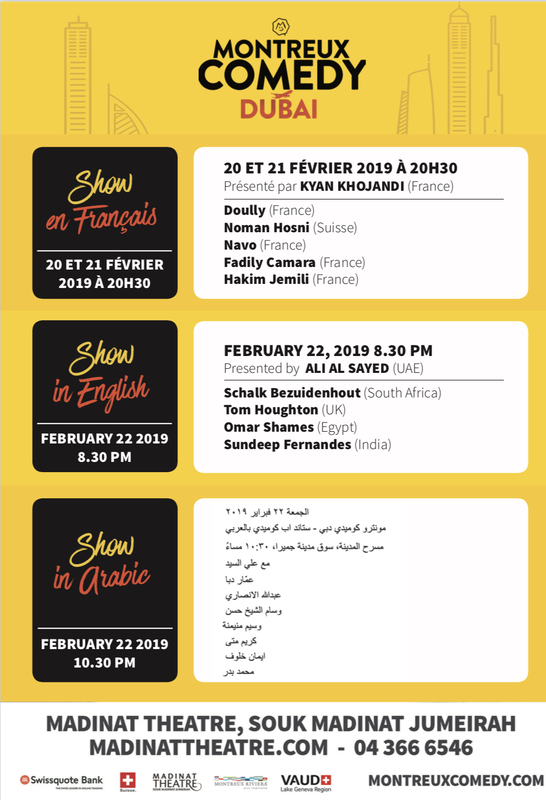 The performance will be half in Arabic, half in English and intended for a bilingual crowd. Oh, and it's FREE! 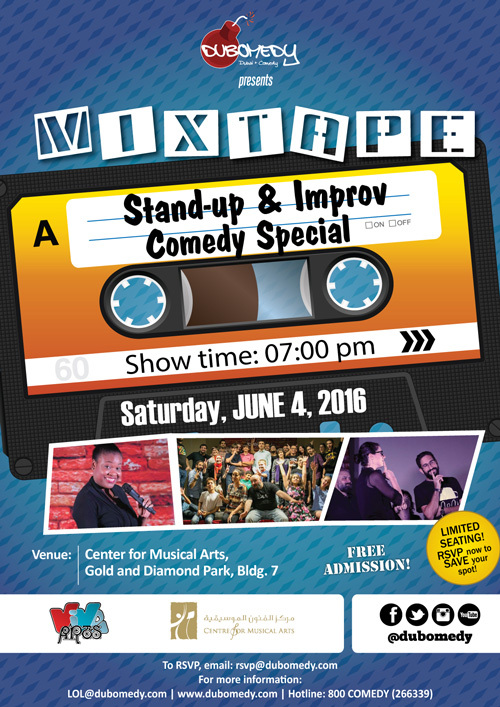 Email us your name and number of tickets to RSVP@Dubomedy.com right away to get on the wasta list. Yalla habibi! Language: Mix of Arabic and English. Intended for a bilingual crowd. RSVP: Yes! You MUST email RSVP@Dubomedy.com to get on the guest list. Join us for the next round of COMEDIANS AT WORK! It's a fresh stand-up night where our Summer Stand-up Intensive students and seasoned guest comedians take the mic. Please send an email with your name and number of guests to RSVP@Dubomedy.com to get on the list! 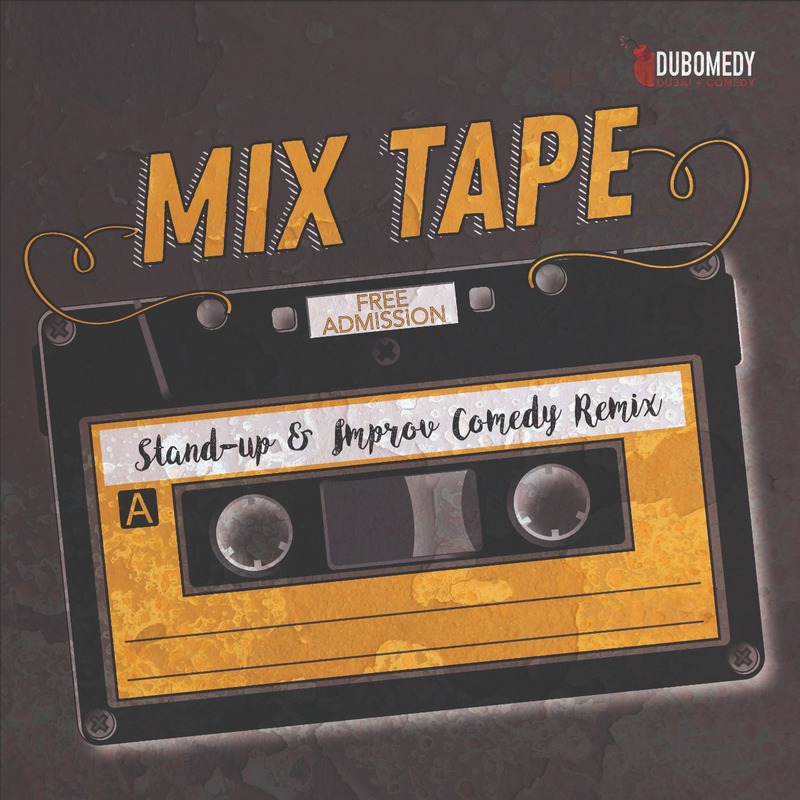 Join us for an evening of LAUGHS as the students of Dubomedy Arts School present COMEDY MIX TAPE: Stand-up & Improv Special. The performance will include a blend of original stand-up sets, improv' games, audience participation and special appearances from Improv Revolution troupe members. Always free, always a party since 2008! Please send an email with your name and number of guests to RSVP@Dubomedy.com to get on the list! Comedians at Work :: 2 nights, 2 free shows! Join us for 2 more rounds of Comedians at Work! It's a fresh stand-up night where both new and seasoned comedians take the mic. The shows are FREE but you MUST email RSVP@Dubomedy.com to get on the guest list. 4B street, Al Quoz, Industrial Area 1, Warehouse 28, Building 3. Mina Liccione & the Funny Girls go PINK! Dubomedy proudly presents... Mina Liccione & the Funny Girls go PINK! 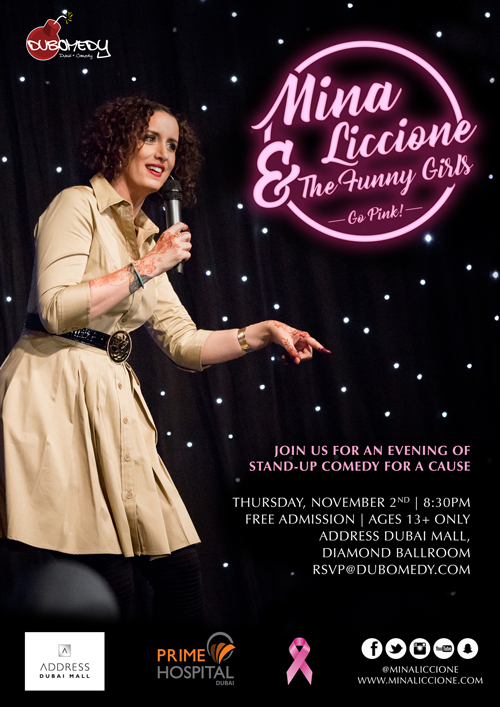 Mina Liccione and the HER-storical Funny Girls are back to perform a special stand-up comedy show in honor of Breast Cancer Awareness! This is NOT a ladies only show and we encourage men to come join us for a laugh! 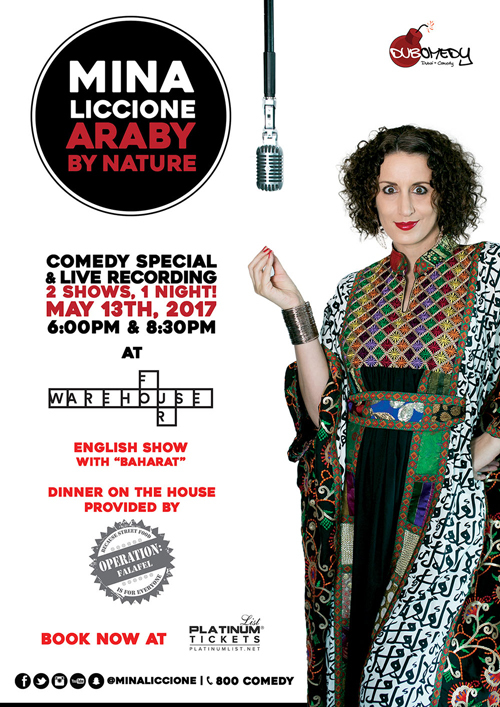 The show will be hosted by Mina Liccione (MTV, Broadway, Comedy Central Arabia) and will feature Dubomedy's beloved Funny Girls; Shaima Al Sayed, Sameera Khan, Jyotsna Lakhiani, Liz Bains, Natajia Tweetsy Miller, Zahra Mirza, Nidaa Babar and special guest Mona Aburmishan flying in from the USA. 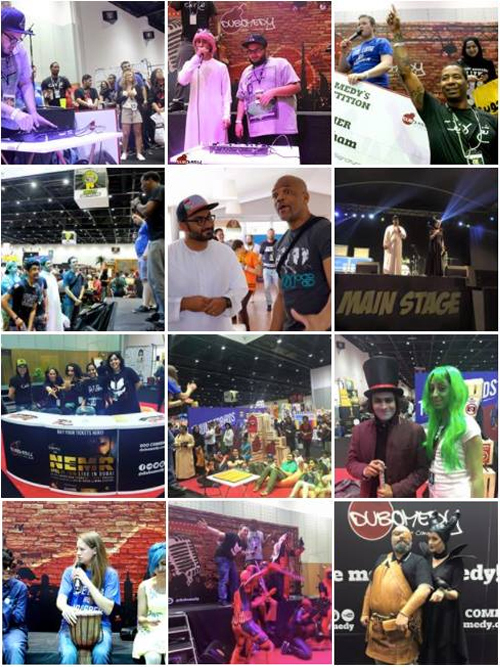 The event will also include a special appearance by cancer survivor Lina Al-Sharif, the Pink Ribbon Crafters, UAE Outpost, 501st Legion, Info booths and free medical exam vouchers from Prime Hospital and Dubai Medical College, all ending with a grande finale musical performance by Bass Mic3! 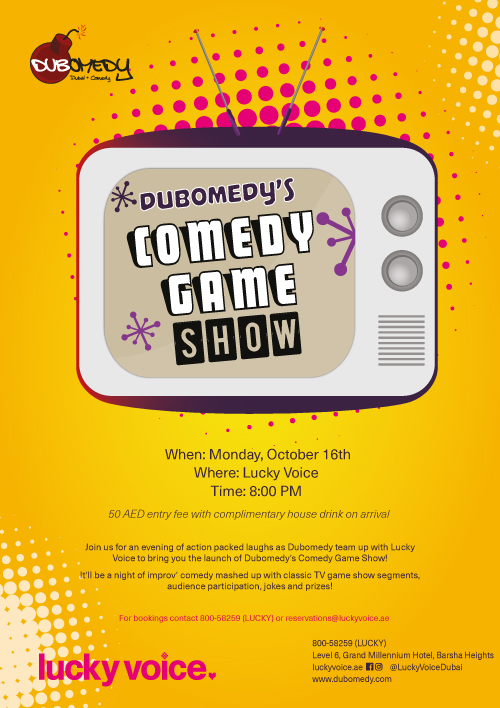 Join us for an evening of action packed laughs as Dubomedy team up with Lucky Voice to bring you the 2nd Edition of Dubomedy’s Comedy Game Show! It’s a monthly night of improv’ comedy mashed up with classic TV game show segments, audience participation, jokes and prizes! 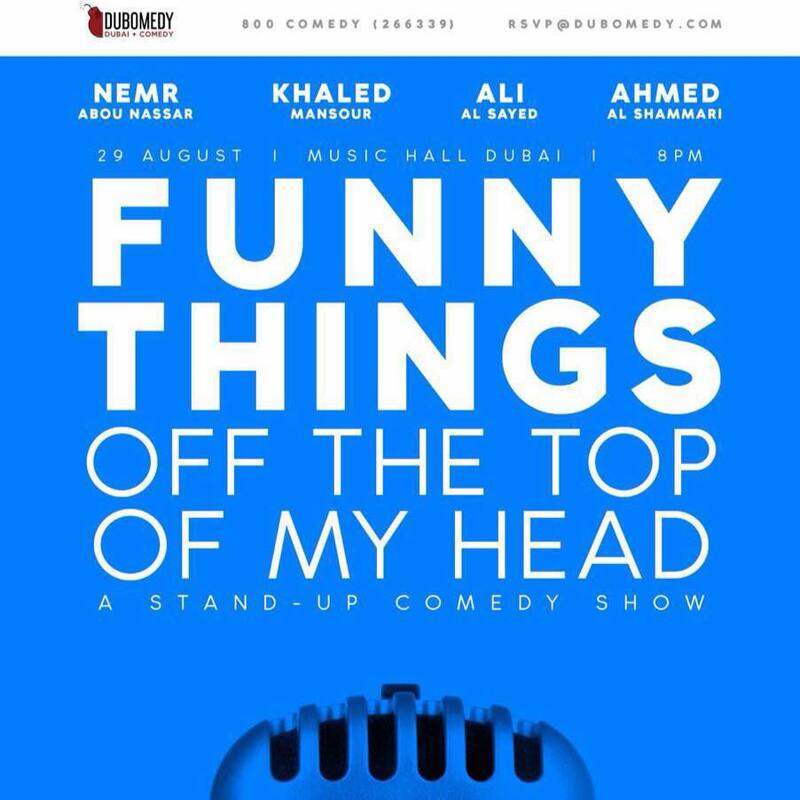 The show is directed by award-winning comedian Mina Liccione of MTV, Cirque & Comedy Central Arabia and will feature a rotating comical cast with special guest hosts. 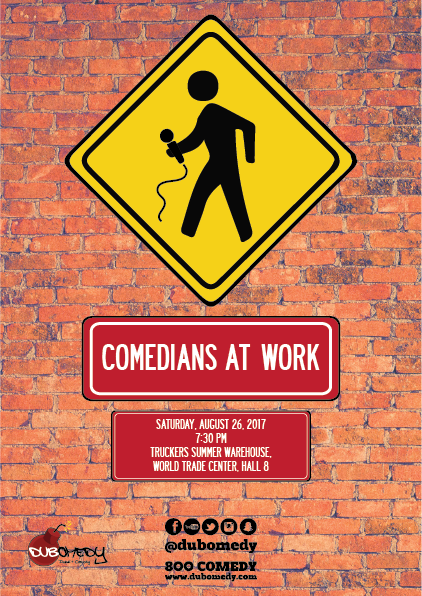 Join us for Round 3 of Comedians at Work! It's a fresh stand-up night where both new and seasoned comedians take the mic. The show is free but you need to email RSVP@Dubomedy.com to get on the guest list. 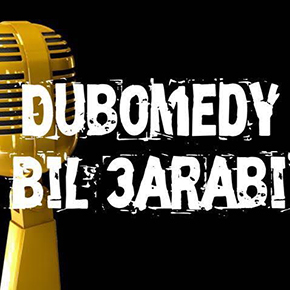 Join us for Arabic Round of Comedians at Work! It's a fresh stand-up night where both new and seasoned comedians take the mic. The show is free but you need to email RSVP@Dubomedy.com to get on the guest list. 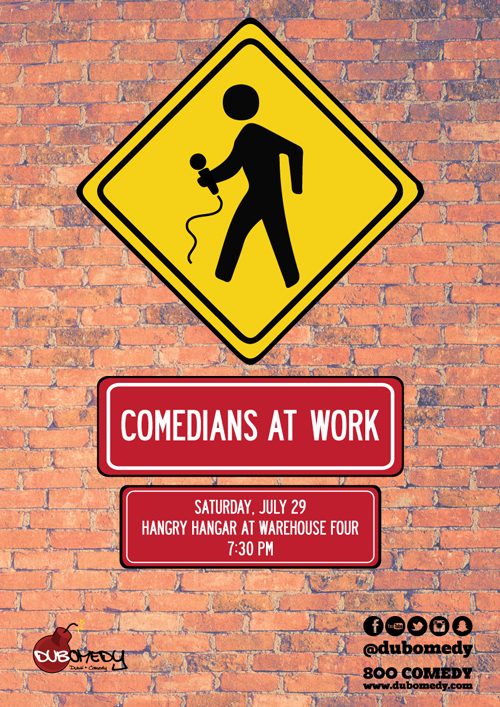 Join us for Round 2 of Comedians at Work! It's a fresh stand-up night where both new and seasoned comedians take the mic. 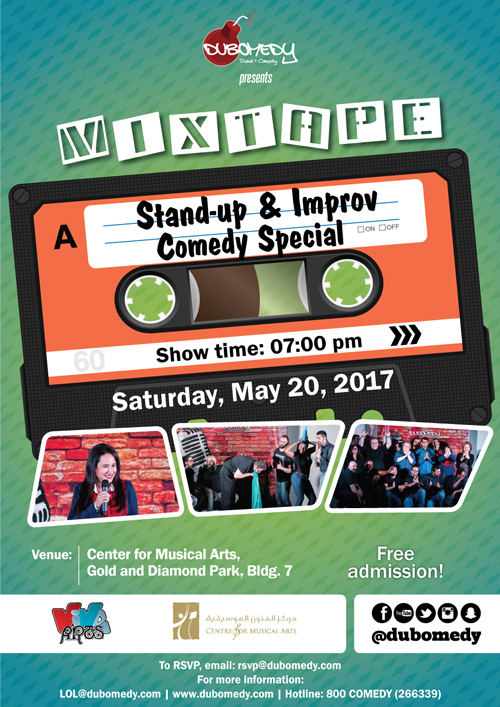 Join us for an evening of LAUGHS as the students of Dubomedy Arts School present COMEDY MIX TAPE: Stand-up & Improv Special. 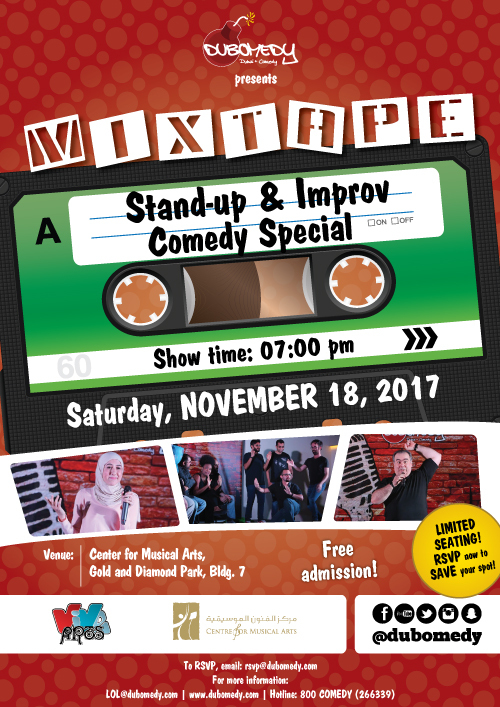 The performance will include a blend of original stand-up sets, improv' games, audience participation and special appearances from Improv Revolution troupe members. Always free, always a party since 2008!Please send an email with your name and number of guests to RSVP@Dubomedy.com to get on the list! 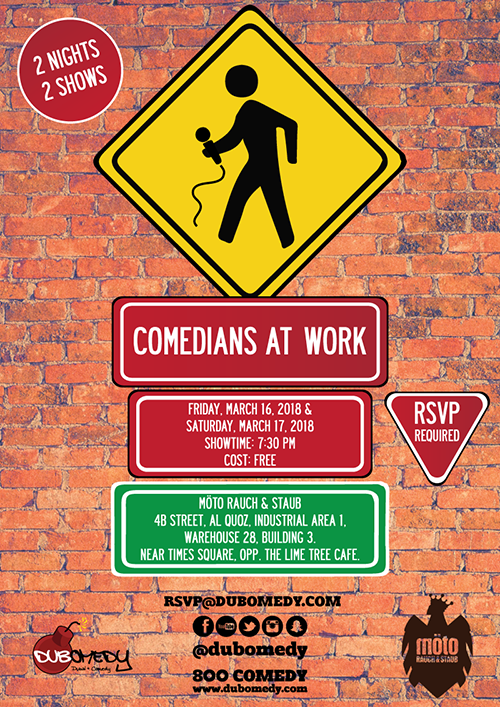 Join us for of Comedians at Work! It's a fresh stand-up night where both new and seasoned comedians take the mic. 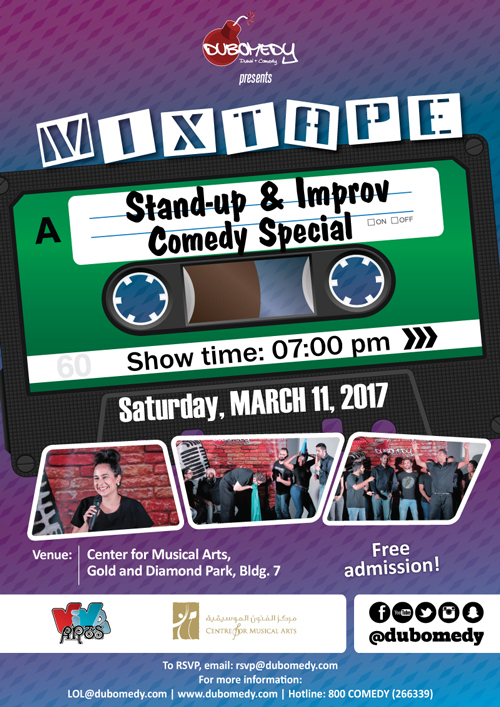 Join us for an evening of LAUGHS as the students of Dubomedy Arts School present COMEDY MIX TAPE: Stand-up & Improv Comedy Special. The performance will include a blend of original stand-up sets, improv' games, audience participation and special appearances from Improv Revolution troupe members. Always free, always a party since 2008! Please send an email with your name and number of guests to RSVP@Dubomedy.com to get on the list! Dubomedy's famed Improv Revolution Troupe will perform a high energy on-the-spot comedy show filled with long and short form games complete with audience participation! Performers include Omar Ismail, Alex Liccione, Sam Moult, Mish'al Eskander, Bashar Nizam, Natajia Miller and Simeon Goodson with Troupe Director Mina Liccione. It’s free, it’s funny and it’s not to be missed!